Garlic Honey? I know this may sound like a funny combo but not only is it delicious (trust me, you have to try it), combining these two food medicines together creates a powerful anti-microbial, decongesting, immune-boosting home remedy. Garlic is amazing medicine in itself (read more below) and raw honey also contains beneficial enzymes and antimicrobial properties. Adding the two together not only makes the raw garlic much easier to ingest, it also helps protect the stomach from any mild irritation the garlic could cause. Garlic Honey can be used as wonderful preventative medicine throughout the year but can also be eaten at the onset of an infection to help fight off bacteria, virus, or fungus, as well as ease sore throats and thin congestion. Need more convincing? 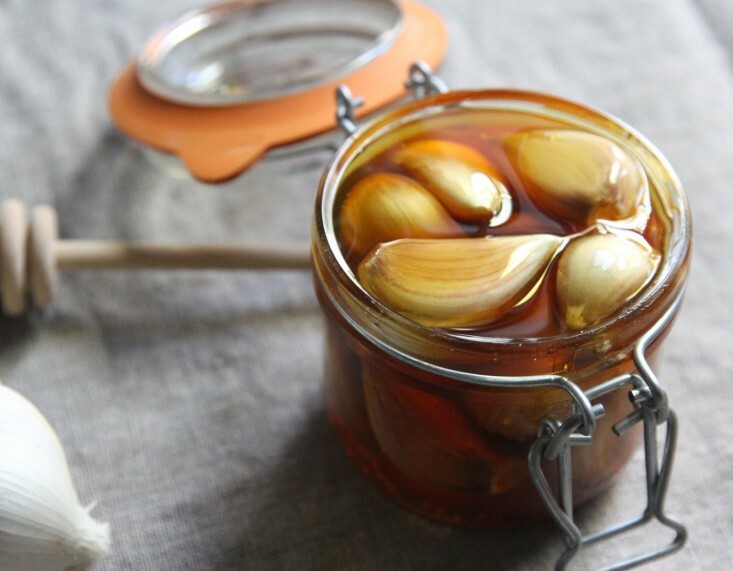 Read on below about the specifics of garlic's medicinal properties and check out the quick and easy recipe for making your own garlic honey at home. 1) Separate cloves of garlic and peel them. Take the flat side of a large knife and crush the garlic cloves and let sit for at least ten minutes. This helps to release the medicinal allicin in the garlic. 2) Fill your mason jar up with the crushed cloves and cover with raw honey. Screw your mason jar lid on and allow your garlic honey to sit out on the counter for 3-5 days. Transfer to refrigerator. 3) You can consume a clove of honey garlic as preventative medicine whenever you like. If you start to feel an infection coming on, a recommended dose is 1-2 cloves, up to 3x/day. Your garlic honey should last in the refrigerator for up to 1 year. Medicinal uses: Where to begin? Garlic is both an incredible preventative and disease-fighting medicine. Garlic is warming and pungent in nature and considered a chi stimulant in Chinese medicine. It increases circulation and metabolism, especially of protein/amino acids, and improves digestion. It is a powerful antimicrobial and capable of killing off a variety of infectious critters in the digestive tract, including viruses, amoebae (dysentery), worms, unfavorable bacteria, fungus, parasites and yeasts, especially Candida albicans. In addition to ridding the GI tract of these pathogenic organisms, garlic promotes the growth of healthy intestinal flora. It also helps eliminate toxins from the body, including neurotoxins from mold, Lyme, and heavy metals, due to its high sulfur content and other antioxidants, which aid the liver in detoxification and scavenge for free radicals. Garlic’s antimicrobial properties are useful for respiratory ailments, such as chronic bronchitis, colds, flus, asthma, and general lung congestion. Garlic also improves cardiovascular health, lowering blood pressure, normalizing cholesterol levels, and cleaning the arteries, helping to prevent heart attack, stroke, and atherosclerosis. Ingesting garlic can also help ward off mosquitoes. Garlic can also be used externally for athlete’s foot (sprinkle powdered garlic daily of wet feet and let dry), ringworm, and pinworms (in suppository form). As an infused oil, it can be used in the ear canal to clear up ear infections (one drop a day). Dosage: As preventative medicine, 1 raw clove daily is suggested. Cooked garlic still has medicinal properties but the allicin, released when fresh garlic is crushed, is most potent when consumed raw. During acute infections, 1-2 raw cloves up to 3x/day is suggested.